Throughout my pregnancy the safest and best option to deliver bub was a constant point of discussion. It wasn’t until 6 days before the birth that I knew exactly how bub was going to enter the world. For those who have been following me throughout the pregnancy know that I have two fairly big scoliosis curves. When I was 17 years old I had an operation to straighten and fuse my thoracic spine (top half) but the lumbar curve was left at 40 degrees (a straight spine is 0 degrees), there's a pic below. I entered into pregnancy with so many unknowns about how my scoliosis would hold up. Surgeon, midwives and physios no one could tell me what it would be like – would I have back pain? Would my scoliosis get worse? Could I deliver vaginally or did I have to have a c-section? Could I have an epidural? I was told at 12 weeks I would be having a c-section but after discussion with my back surgeon at 32 weeks I was given the ok for a vaginal delivery. But at 38 weeks it was the anaesthetist who had concerns about an vaginal delivery. 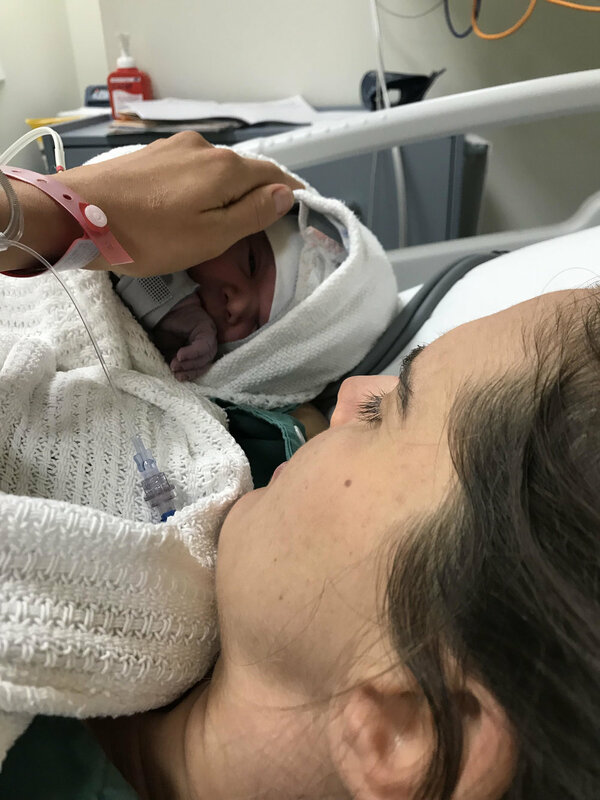 After speaking at length with the anaesthetist as to my options and the concerns from his perspective I was left with the decision to be induced for a vaginal delivery or have a c-section. I had always imaged myself having a natural birth, my mum had birthed 3 children all naturally with out pain medication and I was sure I could do the same. I viewed labour as a right of passage to motherhood (could I be more wrong! ), which meant having a c-section felt like the easy way out. With these limiting believes (which are so untrue) I was really torn between my head and my heart. There was so many unknowns with a vaginal birth, which there are anyway, but for me there were more. How would my back go? Would an epidural work if I need one etc? It was such a hard decision knowing the cons of a c-section in regards to recovery and gut health of the baby but the unknowns of a natural birth and its effect on my back was also a concern. WHAT IS YOUR ULTIMATE GOAL? That is what my mum asked me – “for mum and bub to be healthy and happy” I replied. And with that in mind I made the decision for a c-section for the following Thursday. All week I was hoping I would go naturally into labour but sure enough Thursday came around. My husband and I arrived at the hospital at 6am and were taken to the pre op section for admission. The nurses took my vitals, talked us through what was to come and my husband got dressed into some scrubs and I was given a gown and the most unflattering disposable undies – It was like someone had cut two leg holes in a plastic shopping bag, they were way too big and super hideous!! At 8am I was wheeled to the operating theatre. The anaesthetist was there and he began to prep me for the spinal. This was the scariest part….a needle in the spine! I just stared at my husband the whole time and when I had to bend over for them to put the spinal in I literally just shut my eyes and pretended I was sitting on a beach in Hawaii! Surprisingly it didn’t hurt but it’s scary losing sensation in your lower half! It literally felt like seconds between them putting up the sheet and then this screaming baby being placed on my chest! WOW it’s a moment I will never forget. I couldn’t believe this baby was ours, I had grown him, carried him and now he was with us. While the OB stitched me up, the paediatrician checked over our boy before he was dressed and placed back into my arms. I just stared at him in disbelieve I couldn’t even talk. From there I can’t really remember what happened I was so taken by this little boy in my arms I was oblivious to what was going on around us. I felt really busted up for at least the first 7 days. I walked hunched over like an old lady as it hurt to stand straight, it hurt to laugh and it was difficult to go from sitting to standing. When we left hospital 4 days later the midwives were saying “we’ll see you in a couple of years when you have your next one” and I was thinking how the hell could I ever do this again!! But after 7 to 10 days I felt great and haven’t looked back since. You forget about the surgery and the discomfort very quickly. And I would do it all again in a heartbeat. Although I didn’t get to experience labour or have a vaginal birth I wouldn’t change the experience for the world. My end goal was to for mum and bub to be healthy and happy and we achieved that and that is all that matters. I had a wonderful OB and her team of midwives, paediatricians and anaesthetist were just amazing. The whole experience was so positive, we really couldn’t have asked for anything more. This is my birth story but for those girls with scoliosis reading this thinking they will have to have a c-section too, well you may not. We are all different, our curves, our bodies and although this was the safest and best option for me it may not be for you. I have read blogs of women with scoliosis and women with fused spines who have birthed naturally, so it is between you and your OB how your story plays out. One thing is for sure it doesn't matter how your baby enters the world as long as mum and bub are happy and healthy, then you have achieved your ultimate goal!